Corporate clients come to Equinox when they want projects with fewer hassles, higher quality, and long-term sustainability. We know how important it is for your projects to align with your brand, so we ensure that our work reflects well on your company. Together, we can create environments that increase both profits and pride. Whether it’s developing a piece of property, making landscape improvements to a business park, or evaluating the sustainability of internal processes, good planning and design makes good business sense. 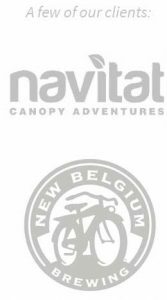 including New Belgium’s East Coast Brewery, Navitat Canopy Adventures, and Duke Energy’s Recreational Facilities. We understand that projects of this scale demand absolute quality, advanced skill, and one eye always on the bottom line. Some of our major corporate clients have been with us since 1998.